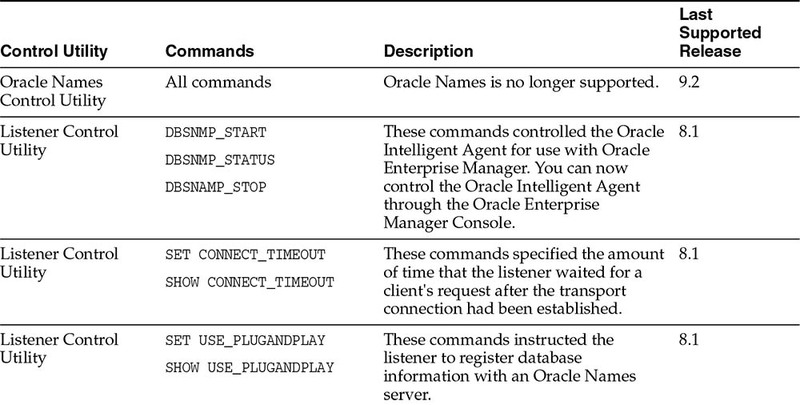 Description: These commands controlled the Oracle Intelligent Agent for use with Oracle Enterprise Manager. You can now control the Oracle Intelligent Agent through the Oracle Enterprise Manager Console. This module takes a close look at Oracle Enterprise Manager (OEM). OEM is designed to be a centralized console from which you can display and monitor all the databases in your environment. Because all the components connect to OEM via Oracle Net Services, understanding the OEM console is an important part of Oracle networking. The Navigator window displays all schema information for each database. The Job Scheduling window allows the Oracle DBA to schedule remote database tasks. The Map window provides a graphical map of your entire distributed Oracle database topology. The Event Management window allows for the definition of customized alerts. We will then turn our attention to the distributed networking capabilities of the Event Manager Console. Multi-Threaded Server was replaced by Oracle Shared Server beginning with Oracle 9i. Additional background processes may exist when you use certain other features of the database: for example, shared servers (formerly the Multi-Threaded Server or MTS prior to Oracle9i), or job queues and replication. Define an Intelligent Agent on each remote server. Use the event manager console to attach to the intelligent agents that run on the remote servers. Define alert thresholds in the event manager console. The next lesson provides an overview of the OEM console.